I caressed him once, once only". Thus writes Charles Baudelaire in his poem Le Chat (The Cat) defining the tamer interpretation of le parfum fourrure ("fur coat perfume"; for more info on this concept please refer to this article and this one). That feeling could equally well apply to the newest Guerlain exclusive, Tonka Impériale (Imperial Tonka). That is, if you rolled your cat onto caramel and roasted almond powder, assuming via some paradox of nature this feline was sympathetic to humans' desserts and borderline torturous treatment! Tonka Impériale is such a strange and compeling dessert following the manner of la grande patiserrie chez Guerlain, but also underscoring the composition with alternating sweetness & bitterness, luscious deep backgrounds and the multi-faceted nuances of one of the most prized materials of classic Guerlains, tonka bean. Tonka, with its rich coumarin load, takes pride of place in the notorious Guerlinade, the common "thread" which characterises some of the classic scents of the house, so an étude on this material within a line which focuses on new spins on standardised materials (L’Art et la Matière within Guerlain's boutique scents portfolio) was a natural. Rather in reverse to what Liszt did to Paganini's motifs however, Thierry Wasser, the in-house perfumer at Guerlain who also composed Tonka Impériale assisted by art director Sylvaine Delacourte, subtracts elements from the classical Guerlains to render a purer, more direct and insistent message, like abstract art interpreting an idea of the Baroque Masters. The fragrance doesn't waver or develop, but manages to appear modern while retaining the luxurious and saturated quality of the old creations. A solinote on this material was sorely lacking for a house who has made it the sine qua non of their olfactory tradition and this new offering is salivatingly tempting, even for non gourmand-following folks! Tonka bean (coming from the South American tree dipteryx odorata) is an exceptional and costly material that presents fascinating facets of culinary delights; from aniseed and licorice notes as well as macaroons, salty toffees and blond tobacco all the way to hay and toasted bread. The comforting factor these facets naturally exude is here coupled to an overdose of rosemary (according to Olfactorum and Esprit de Parfum). The pairing is logical: the almost salty, andorgynous end of tonka is close to culinary herbs. But the comfort factor should in no way evoke an Earth Mother type! In a way this is a modern play on the unisex idea of Jicky: the fougère nuance of lavender (here replaced by rosemary) played on the more langoruous scale of a semi-oriental thanks to the vanillic base (here the more honeyed, caramel and woody tonalities are accentuated). But it will also remind to some the honeyed veil (mimosa, orange flower, heliotropin) of L'Heure Bleue and its bittersweet harmony. Like every great groumand oriental that respects itself, it is also a little bit "poisonous" thanks to the coumarin. The effect materialising in Tonka Impériale is an amazingly restrained and balanced oriental gourmand (much more in check, less boozy than Spiritueuse Double Vanille; equally delicious and wearable to Cuir Beluga) that I voted for with my Visa, as you can see from my photographs. Wearing it on winter sweaters and scarfs (where it clings for days radiating seductively) is akin to getting caressed by a honey mink étole while smelling fine cigars in a salon de thé serving the most delicious almond pralines on panacotta. Those who would be intellectually intrigued to see Guerlain spin a David Hockney and who keep their lava lamp close by will be left critisizing Guerlain for bourgeoiserie. Those who appreciate keeping the heritage alive will embrace Tonka Impériale with enthusiasm. Tonka Impériale is available exclusively at Guerlain boutiques & spaces at 168 euros/230$ for 75ml of Eau de Parfum, from February 1st. For our readers, to give them a chance to try this fabulous new fragrance, a big sample will be handed out to one lucky winner. Draw is now closed, thanks for participating! All photographs by Elena Vosnaki/Perfumeshrine. Click to enlarge. Sounds wonderful! 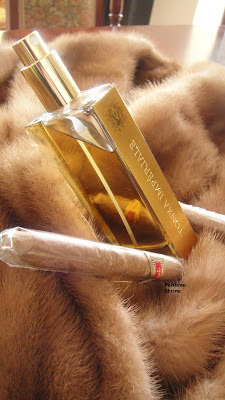 ...."caressed by a honey mink étole while smelling fine cigars in a salon de thé serving the most delicious almond pralines on panacotta" Please include me in the draw, as this may be the closest I'll ever get to wearing a mink! I'm so glad you love it, dearest E, and thank you for a delightful review. One of the loveliest things about this new Guerlain is that it is a gourmand for people who don't like gourmands, and so I think it will have a very wide appeal. As only Guerlain could do it, I'm sure! Please enter me in the drawing. Thanks so much! To spare my cats the indignity of being rolled in sticky, sweet things, please enter me in the draw :) It sounds very nice. This is lovely and I will spring for a full bottle as soon as possible. I the mean time I would love to be in the draw! This sounds just perfect. The comparison to L'Heure Bleue has me quite intrigued. Please enter me in the draw. I would like to be in the draw. Please include my [sadly ] greedy bottom, would you ? Mmm yummy tonka. Heh and about the cats, I do remember once I was wearing amber fetiche and was petting a friends cat and later she commented they smelled weird. I would love to be entered in the draw for this! Would love to be in the draw. Thanks for your generousity. Wow! Sounds like a home run. :) I am definitely interested in the draw. 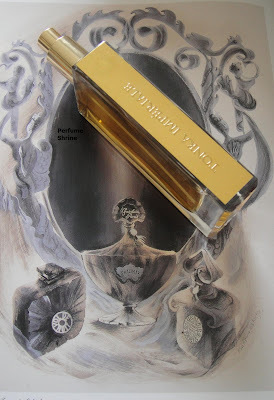 With the toast nuance, is there any similarity to Mugler's Miroir des Vanities, a really unusual but engaging jasmine-toast-hazelnut-musk fragrance? I would love to try this, E.
I would love to smell this, Guerlain is one of my favorite houses. Incredible description of cat fur scents. Oh yes indeed, interest duly stated, calming heart down over the thought of it! Finally new scent in the L’Art et la Matière range, I am really curious! Please include me in the draw. I love both Bois d'Armenie and Cuir Beluga so this new release sounds like something I will adore as well. Thanks for a great review! Very interested! Just the words macaroon and almond make me swoon along with the caramel. Please enter me in the draw. Thank you. Oooooh! Excited to try this. Please include me in the draw. Thanks!!! Oh my...I would love to try this! Especially now that winter in Germany doesn't seem to be ending. I need a fragrant equivalent for a cashmere scarf! I am absolutely interested, E. Please place me in the drawing. Hugs! Thank you for your generosity! Sounds amazing - count me in too! A lovely review again. Please enter me in the draw. I Thank You, my cat thanks you ! And love the little poem, too. I amp tonka's sweetness like crazy, but I love it! Wonderful review, E. and here's to keeping the heritage alive! It hasn't arrived on this side of the pond yet, so I would love to sniff a sample. I'm seriously considering a bottle, or at least a split. Thanks for this great opportunity, E! Well, I wasn't interested in this until I read your lovely description. Please enter me - ευχαριστώ! I'm so curious about this one! Please include me in the draw. Thanks! Oh, this was a beautiful review! I love tonka bean, I love Guerlain, and it would be interesting to see if I could love a gourmand! Please enter me in the draw! Please!!!! I want to try it, enter my name in the draw please, please, please pretty please!!! This sounds really cool, please I'm really interested, put my name in the draw please. Tonka Imperiale sounds awesome, I.m in! Enter my name in the draw please. I had the opportunity to try this perfume. It is very lovely and a great contender for a full bottle purchase. Your review has described it so beautifully, and very close to my own impressions. I am glad that you always have the right words. I don't need to be included in the draw. Thanks, E. Always a pleasure to read your blog. Oh, I have dreamt of this perfume for few days. And what you say here lets me longing even more for it. My only hope was that may be I'll go to Paris in May, but it's not sure. From all I have read it could be a new Holy Grail for me. Enter me for the draw! I started lemming about Tonla Imperiale since the fist review came out... I would LOOOVE to try it (no Guerlain counters around here! ): I am definetly stating my interest!! Oh E - Thank you for this most welcome review. One of my perfume friends from London bought it . It sounds so sensual and naughty , like a rich , vanilla , caramel dessert.I used every last drop of SDV - I believe I would eat this one up ! Wow! This sounds incredible. Although I'm sure it smells in real life even better than I imagine it. Hi Helg, what a lovely, intriguing review. I'm really interested, put my name in the draw, please! I'm not sure it can compete with the smell of my cats fur, but I'm very tempted by this perfume, and it's a long way to Paris. Please include me in the draw! Is there some way how to be added to draws automatically, without the need to invent a new rant along the lines of I want haz now! while trying not to sound greedy? Well, count me in. As always. ....the photography, your beautiful prose...please enter me for the sample. Hello Helg,wondeful article!<> sounds very interesting and sounds real Guerlain. I would be grateful if you could iclude me to the draw. Thank you! Oh goodness, is it so good that you sprang for the FB? That sounds great. I am vastly, hugely interested. This sounds like exactly the sort of fragrance I've been wanting to cozy up to. Lovely review! I am intrigued, please enter me in the draw. Thanks! I can't wait to try this. Please do enter me in the drawing. Please enter my name in the draw, I'd love to try this one. OMG, it sounds really fabulous... I would be so happy to sample it!!! I love Jicky and l'HB so TI should be right up my alley!!! HEY LADY!!! THROW ME SOMETHIN'!!!!! I want to try this one, please enter my name in the draw. I am a total sucker for the Guerlinade and I think the tonka bean is a major reason for that. I would love a sample. Rosemary? I must try this. Oh, wow! Guerlain's perfumes are one of a kind! I got Idylle yesterday and can't get enough of it - the scent is like purest magic! Aaaaaahw! (Haute) Bourgeoisie is exactly where I want Guerlain. There's plenty of avant-niche around for those who want it, but not enough classicism. If this smells half as good as the tonka creme brulée I once had, I'm sold. Needless to say I'd looove a sample of it. It sounds lovely! I would like to sample this one. Please add my name to your draw! sounds delicious! i hereby state my interest in that lucscious sample! It sounds fantabulous, I would love a sample. What a beautiful and evocative description of this exciting new scent. Please enter me in the drawing. I would love to have a chance to try this, and barring a trip to Paris in the near future, it might take a while! Oh my goodness, I'm a Guerlain girl all the way! Mitsouko, Shalimar and Jicky are the ones I wear the most.....I would love to be in the running for a sample. I need this one regardless! Thank you! Please enter me as well, though I'm sure my cat does not want to be dunked in caramel and rolled in almond powder! I state my intent as well! 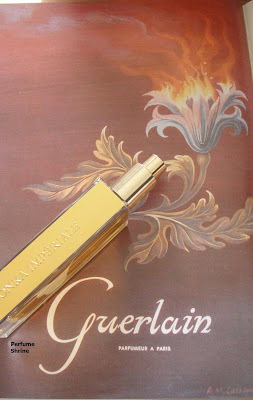 I love tonka and am just entering the world of Guerlain, so I would love to try this! Oooooh this sounds just absolutely triple delicious !!! Thank you for another great review! I would love to try this one, please enter me in the draw as well! Ooh, please include me! Your review definitely has me salivating. Oh yes, I am interested in sampling this fur coat perfume. I am intrigued! If it is not too late, please enter me also. Thank you! Can't say I've liked many of the modern Guerlains, but this one sounds promising. Would love to be entered. Oh, MY. I am very interested. All the more because I didn't think I would be. And congrats on your venture above! I would love to try this -please enter me in the drawing. Thanks! This sounds wonderful- I would really love to try it! Please enter me in the drawing. Thanks! If it's not too late...please enter me in the draw! Thanks. This sounds great, the matiere line perfumes all lie so close and softly against the skin; I'm most excited to try this. Please enter me if the drawing is still open. Thanks everyone for commenting and for your kind remarks re: the review and the photography. Much appreciated! The draw is now closed and a winner has just been announced on the home page, but the entry is still open for other comments and your questions.